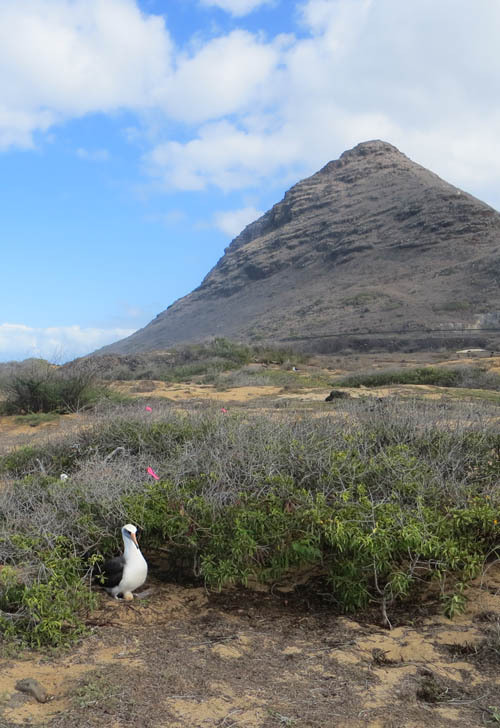 For the past several weeks, I have been hiking to Kaʻena Point — the western most tip of Oʻahu — to see Mōlī or Laysan Albatross during nesting season. 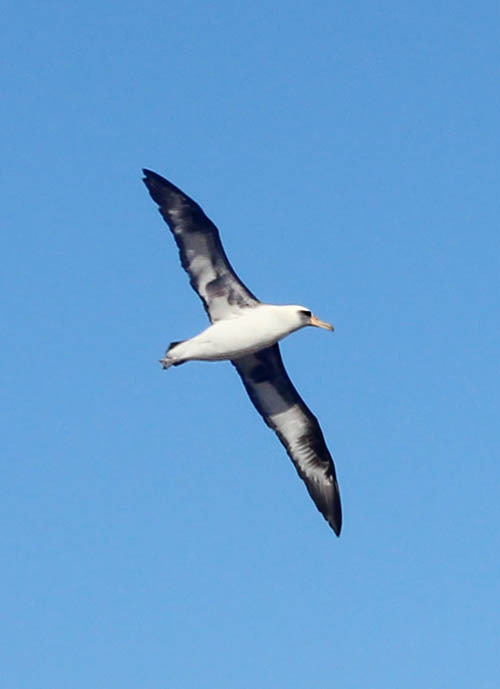 Laysan Albatross (Phoebastria immutabilis) are large pelagic seabirds that range over the North Pacific. 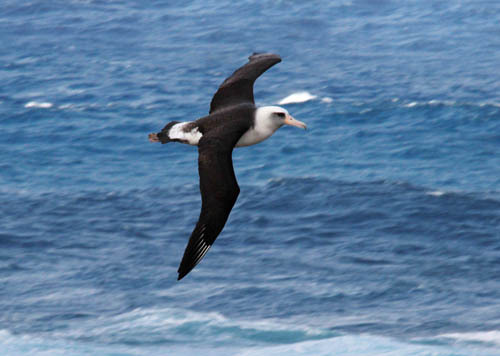 For months at a time, the birds live over the ocean eating and sleeping almost entirely on the wing although they are known to take breaks by floating on the ocean surface. The birds are big — about 32 inches long with a wing span up to 80 inches long and can weight up to 9 pounds. Mōlī are black and white in color. The birds have a black smudge over their eyes, and a pink-yellow bill with a gray hook at the tip. Mōlī must return to land to lay eggs and raise their young. 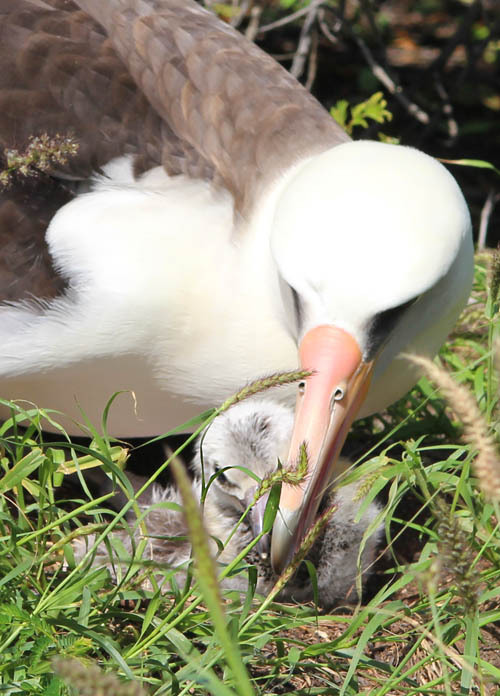 99.7% of the population nest in the Northwestern Hawaiian Islands. Its main breeding colonies are on Midway and Laysan. 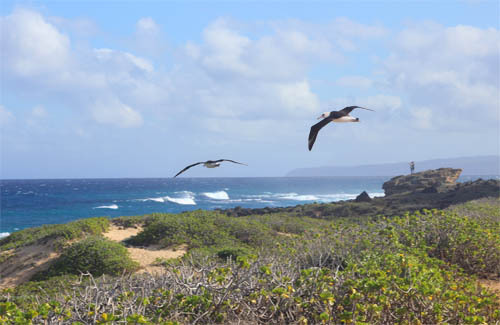 Much smaller populations are found on the Bonin Islands near Japan, the French Frigate Shoals, on Kilauʻea Point on Kauai, and at Kaʻena Point on Oʻahu. 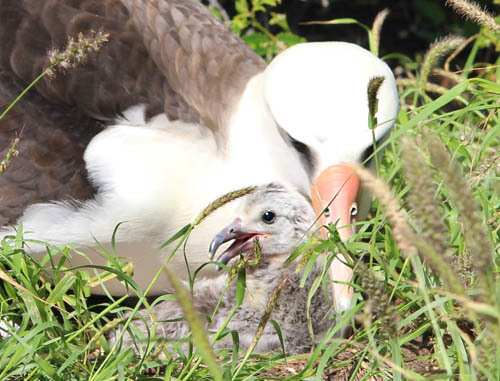 Mōlī arrive at Kaʻena Point and other nesting sites during ho’olio — the rainy season — around November — and stay until their chicks fledge — around April. This is the time of year when the surf picks up on the north and west facing shores and the birds play in the winds deflected by the waves. The pattern of black and white on the underside of their wings are unique to each bird and can be used to distinguish one individual from another. 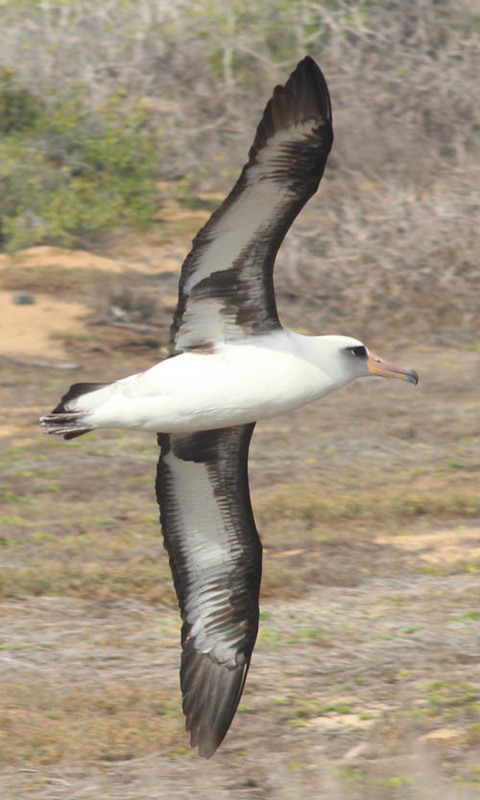 Albatrosses are heavy and require a running start to get airborne. It’s always amusing to see the birds run and jump-up into the wind to get off the ground. 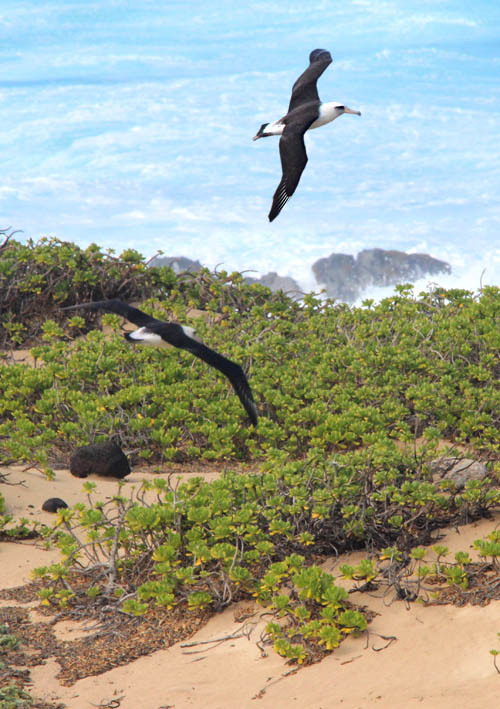 From the western most tip of Kaʻena Point, the birds often fly towards Mokuleʻia and the leaping rock — “leina aka uhane” where according to Hawaiian tradition, the souls of the dead leap into the next world. 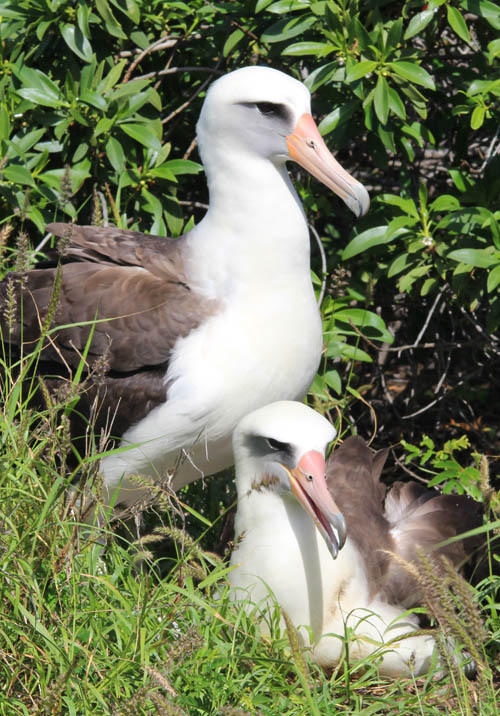 Mōlī form life long monogamous pair bonds and reunite at Kaʻena Point each year. 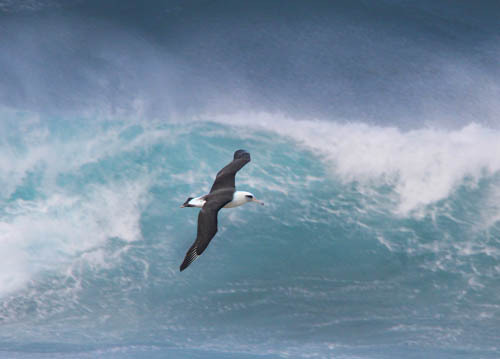 The seabirds perform amusing pair-bonding behaviors like head bobbing, bill dueling, marching, whistling, and bill clapping which are always fun to watch. The birds lay a single egg each season often in a depression in the sand hidden among native coastal plants like this naiʻo or fasle sandalwood (Myoporum sandwicensis). 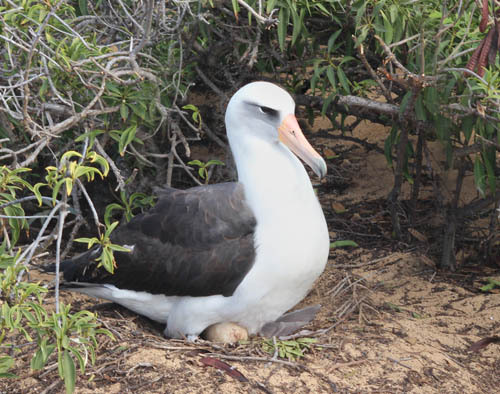 Both birds are devoted parents and they take turns incubating the egg for about 65 days. The parents sit on and protect their newly hatched chicks. I waited for 2 hours for the parents to switch and reveal the chick. The newly hatched chick was covered with a soft grey down and was about 5 inches long. The little chick was so cute that I have to go back to see it grow, develop, and fledge. 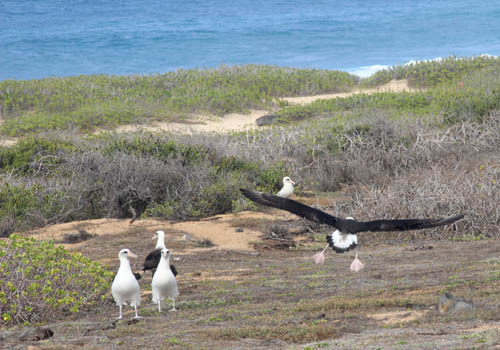 Now is THE time to visit Kaʻena Point — with the land green from the winter rains, the whales breaching off shore, and the albatross chicks hatching from their eggs!